The only Champions Cup fixture of the weekend is a hugely significant one. 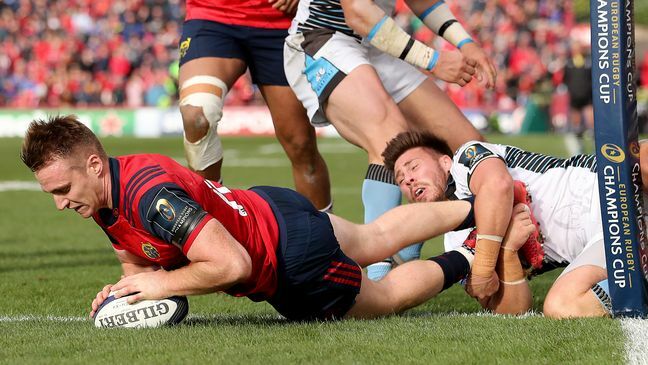 Munster travel to the city of light in the rescheduled game between themselves and Ronan O’Gara’s Racing 92. Racing’s interest may be partly diminished by the reality that their hopes of progressing have already been extinguished, but history suggests they will refuse to roll over. Indeed, the Parisians have lost just twice in their last 27 encounters at Stade Olympique-Yves-Du-Manoir. Like Munster at home against Stade last year, Racing have far too much pride to throw in the towel – or at least straight away. Another big outing for John Ryan awaits today as he aims to add Khatchik Vartanov to his lengthy list of looseheads that he has demolished this season. The 28 year old Corkman expressed his disappointment with Munster’s scrum against Leicester in the previous Champions Cup game but is now looking likely to play a key role in the province’s chances this afternoon. Vartanov as a 23 year loosehead has little to no experience at this level, meaning an exceptional scrummaging side like Munster will try and capitalize at every opportunity. Thomond and Musgrave Park regulars will tell you that young Rory Scannell is one of Munster’s finest players and he has been selected at inside centre once again for the trip to Paris. The Cork Con playmaker has excelled in the league and in Munster’s home Champions Cup encounters to date but today may be the day that he packs his pace, power and precision from the boot in his suitcase. It’s looking like this game may just open up more than any other away day that we’ve seen in the last two seasons and that will suit Scannell down to the ground. Don’t be surprised if he puts on a show here today. Munster meet Kiwi old boy Casey Laulala for the first time since his departure in 2014 today and although they will know what to expect, Laulala is the type that always has an extra trick or two up his sleeve. Jaco Taute’s tackling is never in doubt and is sure to lay his opposite down a marker at some stage but you can equally so expect his mobility to be tested against such a dangerous stepper and offloader. Imhoff is easily one of the most dangerous open field runners in the sport anyway, but now starting at fullback, the Argentine will get extra opportunities to express himself. He punished Ireland at the World Cup when they failed to fan out across the park on defence and with himself and threatening wingers Joe Rockocko and Teddy Thomas on Racing’s teamsheet, Munster must not only commit low numbers to the rucks but also kick accurately throughout. The last thing Rassie Erasmus’ men need is for the Parisian powerhouses to spend the afternoon running loose kicks back into them. MUNSTER: Cronin, Scannell, Ryan, Holland, Ryan, O’Mahony, O’Donnell, Stander; Murray, Bleyendaal, Scannell, Taute, O’Mahony, Conway, Zebo. Racing aren’t coming at this one with all guns blazing. Their team is very much so second choice and this fixture means a whole lot more to Munster. The individuals on the field will put up a fight at the start, but I think Munster have more than enough to grab a valuable win.